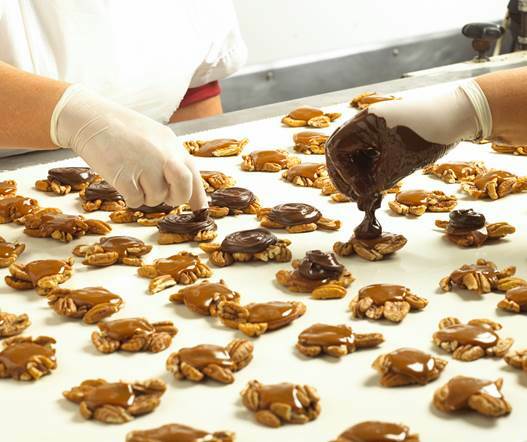 Welcome to the Sweet Shop USA, the largest factory of handmade chocolates in the country. In their 80,000 square foot facility, this family owned company produces the kinds of chocolates that presidents of the United States feel compelled to write letters about. We sat down with Michael Moss, President and CEO and Diana Pirelli, VP of Sales & Service to get a glimpse inside this magical space. For both Michael and Diana, a typical day at Sweet Shop USA involves a lot of meetings, from QA updates to R&D check-ins all the way to interviewing potential candidates or managing orders and requests from the various teams. Together they work to make the day to day run smoothly so that all the confections can be made and shipped out to clients in a timely manner. Michael was already working in the food industry when the former owners of the Sweet Shop USA reached out to see if he might be interested in running their business when they retired. Being married to the world’s biggest chocolate lover, Michael had no choice but to say yes, something he never regrets doing. Diana began her chocolate career as a buyer, but she joined the Sweet Shop USA team when they created a customer service management position just for her. They knew that she needed to be on the team and found a way to make it happen. Having worked in the food industry for 10 years before becoming a candy maker, Michael thought he knew what to expect when he became President and CEO. He wasn’t prepared to discover the emotional connection that people have to candy and chocolate. It’s something that just doesn’t exist in other parts of the food industry. He loves watching the joy on customers’ faces when they try a piece of candy at trade shows. Diana gets a kick out of watching people stop in their tracks because something is just so delicious. 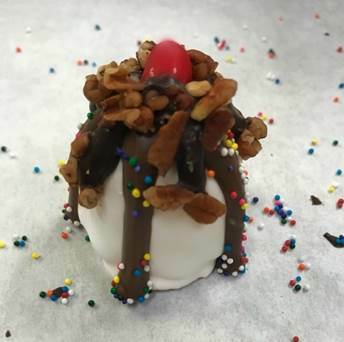 At the Sweet Shop USA, creating confections is a team effort, so it’s a good thing that the team is great. As Diane says, “It’s wonderful to be with a company that is so joyful.” Everyone is encouraged to be creative and artistic and to embrace being involved in every aspect of product development and creation. 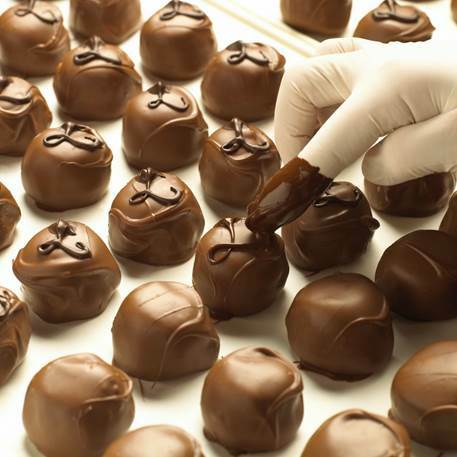 The Sweet Shop USA team launches 3 to 5 new truffle flavors a year as well as 3 non-truffle chocolate pieces. The ideation process usually starts with a review of current market trends and what customers are enjoying before moving into the kitchen where the ideation team comes up with concepts that both look and taste good. Sometimes ideas come from reps who report back on confections they’ve seen out in the field. Other times, customers call to make special requests, like the year a client asked if they could possibly order chocolate tamales. Nothing is off the table for the Sweet Shop USA team! Of course, not every idea is a good one. About 75% of the ideas never come to fruition. The flavor has to be absolutely perfect and the decorations have to be just right. The market and the customers have to be ready to receive the new flavor and the packaging has to turn out right. Many stars have to align before a new product hits store shelves. Recently the Research & Development team worked tirelessly to develop a ‘bananas foster’ truffle, but no matter what they did, the banana flavor just wouldn’t come out right. The truffle ended up tasting so much like a banana split, that they shifted the focus and renamed it. Because the Research & Development team is willing to entertain all sorts of concepts during the ideation process, sometimes the results are a little unconventional. Take, for instance, the Black Garlic Truffle, or the chocolate made with an actual black truffle mixed with sea salt caramel. 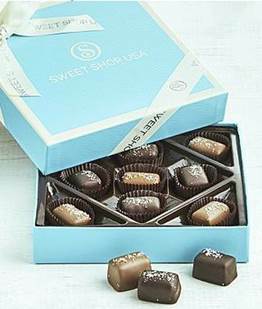 The most popular of the Sweet Shop USA truffles are the Sea Salt Caramel and the signature Fudge Love. Don’t ask Diana to pick her favorite Sweet Shop USA product to give, she won’t be able to choose just one. That’s probably why, when she needs to bring a gift somewhere, she ends up bringing a basket of goodies. However, the basket almost always contains some caramels and some of Mrs. Weinstein’s Toffee, a known favorite of Chef Julia Childs and Bill Clinton. These days, Michael is really loving the new line of Everyday Boxes. The boxes are color coded to make it easy for customers to pick their favorites. His is the blue, sea salt box. Last April, the entire Sweet Shop USA team worked together to break the world record for world’s largest truffle. 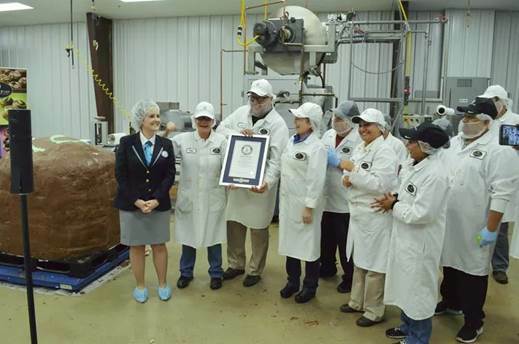 The giant Swiss Mint Truffle weighed in at a whopping 2368 lbs. After the truffle was weighed, it was cut up into 1lb segments and given away to attendees and sold in the store. It was the most fun anyone had ever had at work. Everyone on the team was so proud to have pulled off the impressive feat.